Legendary high school basketball coach Morgan Wootten and his son, coach Joe Wootten share their insights on building a dominating defense. The program covers numerous drills and concepts designed to improve individual and team defense, and shut down opposing offenses. These drills will reinforce proper responsibilities and rotations withing the defense. Among the topics covered are: defensive stance, one-on-one full court, defending players without the ball, building a team defense, guarding cutters and box out drills. 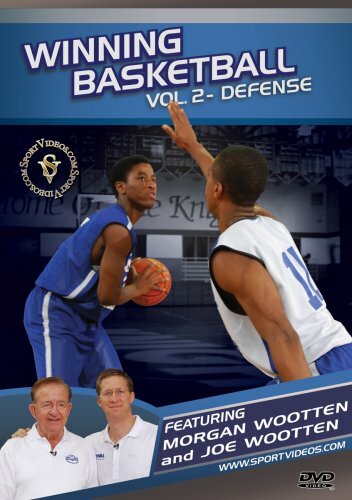 This comprehensive DVD is essential for any coach interested in developing an aggressive defense! About the Coach: Morgan Wootten coached an amazing 1,274 wins during his tenure as Head Basketball Coach at DeMatha High School in Hyattsville, MD. The prestigious Naismith Foundation has named Morgan Wootten the #1 Prep Coach of the 20th Century. On October 13, 2000, he was inducted into the National Basketball Hall of Fame. Joe Wootten is the head coach at Bishop O'Connell High School in Virginia. He has led the Knights to four Virginia State Championships.